An eight year old neutered male Hungarian Vizsla presented to the Highcroft Emergency Service with a 48-hour history of fulminant gastroenteritis, complete anorexia and marked lethargy. He was stabilised with symptomatic treatment and intravenous crystalloid therapy and a minimum database of haematology, serum biochemistry and urinalysis was obtained. There was surprise and some concern to see the clinical pathologist’s comment that large, atypical lymphocytes were observed on a blood smear; the total lymphocyte count was markedly elevated at 29x10e9/l. Key differential diagnoses for this included stage V lymphoma or acute lymphoid leukaemia and the dog’s owners were understandably shocked. Deciding whether you have a stage V lymphoma or an acute leukaemia is more than just an academic question; most stage V lymphoma cases should respond favourably to treatment and many studies show that involvement of the bone marrow makes no difference in the lymphoma’s prognosis. Acute leukaemia on the other hand, is characterised by a poor response to treatment (in the order of 30% of dogs respond) and remissions are not durable. Before deciding whether to nurse the dog through the current gastrointestinal upset and then treat with cytotoxic drugs, it is desirable to have information on the ultimate prognosis! Fig 1: Large atypical lymphocytes are marked with red arrows. So how can we tell which is occurring? First the dog him/herself can give you some clues. Lymphoma which involves the bone marrow often also involves grossly enlarged peripheral lymph nodes and/or organomegaly, the count of abnormal circulating cells is often low, and cytopaenias are often mild or absent. Dogs with acute leukaemia usually have prominent lymph nodes, but rarely exhibit the gross lymphadenomegaly of lymphoma cases, cytopaenias are usually more severe and the count of atypical cells is usually high. These guidelines serve as a rule of thumb for what to expect but cannot be relied upon completely. In the dog in question, findings were discordant. The count of atypical lymphocytes was quite high, peripheral lymph nodes were small, and imaging with thoracic radiography and abdominal ultrasonography revealed no organomegaly, suggesting an acute leukaemia. However no cytopaenias were seen, and since the count of atypical lymphocytes was so high, depression of some cell lines (most reliably neutrophils and platelets) would be expected. To characterise the atypical lymphocytes in more detail, Dr. Owen Davies of the Highcroft Oncology Service submitted blood for flow cytometry. Flow cytometry is a more categoric way of distinguishing between lymphoma and leukaemias because it can demonstrate if the cancer cells exhibit the stem cell marker “CD34.” Circulating cells that are CD34 positive can be considered to be representative of early bone marrow precursors (suggesting acute leukaemia) whereas those which are negative are considered to represent lymphoma. Flow cytometric evaluation of blood then is probably the most definitive test we have to differentiate acute leukaemia from lymphoma, but beware that results can sometimes be erroneous; cancer cells, by definition, have escaped the body’s control and so there are no absolute rules as to which antigens they should or shouldn’t express! In this case, flow cytometry was very revealing. The lymphocytes were negative for CD34 (supportive of a lymphoma diagnosis), but by the pattern of expression of other cellular markers, and in combination with review of the cellular morphology, the diagnosis of a chronic large granular lymphocytic leukaemia (CLGLL) was made. Often, a chronic lymphocytic leukaemia is not initially considered as a differential diagnosis where large, atypical lymphocytes are in circulation. In this case however the large “atypical” lymphocytes were actually the normal morphology of a small proportion of cytotoxic lymphocytes which have undergone neoplastic transformation. As per other chronic lymphocytic leukaemia cases, CLGLL typically has an indolent clinical course (survival time lasting over 18 months from diagnosis in many cases) and many oncologists elect not to treat the disease until the lymphocytosis is severe (or clinical signs are present). In this dog, we have been monitoring the lymphocyte count every four to six weeks for seven months, and have yet to initiate treatment. When we ultimately start treating this dog, we will use oral, alkylating agent-based therapy, given at home. And the sickness and diarrhoea? The gastrointestinal signs resolved within a few days of supportive care. The diagnosis of CLGLL seems to have been completely incidental. If you would like advice on the investigation or treatment of a challenging neoplastic case, please feel free to contact the Highcroft Oncology Service for help. Flow cytometry is available in the UK and turnaround is often rapid. Please check with the lab concerned on how they would like the samples taken and shipped. 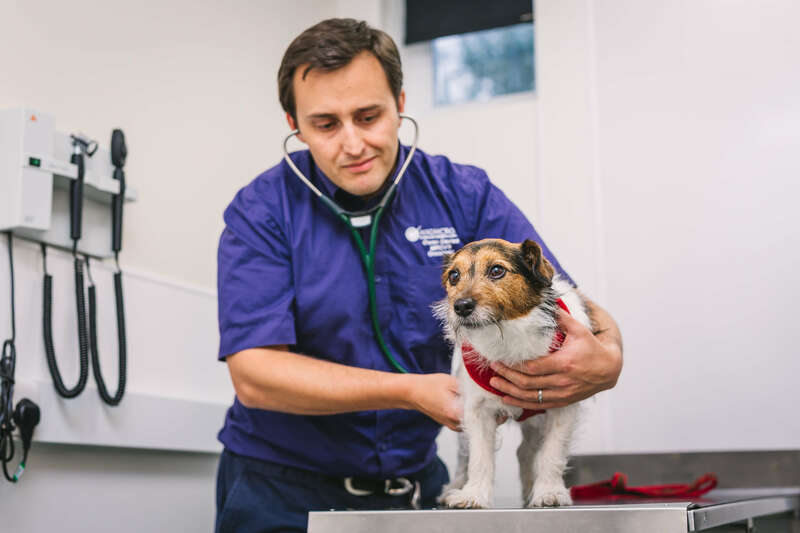 If you have a sick dog with a neoplastic lymphocytosis and you’d like advice on management of the case, please feel free to contact the Highcroft Oncology Service.